The Webmaster made sure to drop by the infamous Chungking Mansions, home to Wong Kar-Wai's Chungking Express. 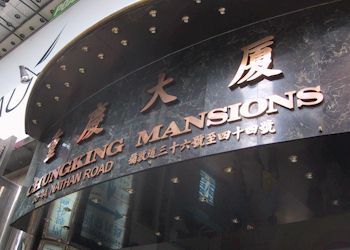 Chungking Mansions can be found on Nathan Road in the southern portion of Tsimshatsui. It's an absolute must-visit for the HK Cinema fan. Just don't stay there. Continuing our current theme, here's Midnight Express, the cheap lunch counter which Faye Wong danced behind in Chungking Express. As you can see, it's a very small place. The food there is decent, though not as cheap as you'd expect. 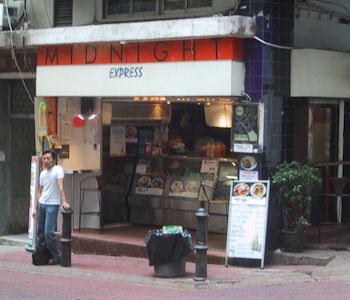 Midnight Express is located in Lan Kwai Fong, the famous clubbing street that can be seen in many a Hong Kong movie. The guy standing in front of the place? I have no idea who he is. 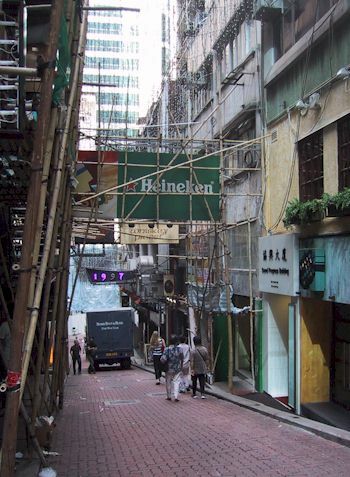 To the right is a truly horrid picture of Lan Kwai Fong, Hong Kong's premier clubbing street. As you can see, there was some construction going on, so the street is barely recognizable. The (obviously named) 1997 Bar is visible, and Midnight Express is located at the very end of the street. However, distance and a large truck are blocking the view.